Adventure Time was one of those shows that I never got to watch as it aired, due to 1) not having a television and 2) the whole thing starting before streaming really took off (otherwise I would have paid for individual seasons through Amazon, the way I do with Steven Universe and The Good Place). But I’ve still seen a handful of episodes, mostly on airplanes, and every time I’ve thought I could really get into this show, if I took the time to do it. Then I saw this YouTube video, Adventure Time and the Nature of Endings, which was released as part of Movies With Mikey’s Lessons Animation Taught Us series (to which I contributed my own video, on Muppet Babies) — and I realized that, now that the series had ended, it would probably be a good time to watch the whole thing. Especially because of the way it ended, which, no spoilers, but it’s kinda relevant to what’s going on in the world right now. So yay, let’s listen to BMO sing “Time Adventure” and experience the emotional catharsis that we can’t exactly have about our actual global/political situation because it’s still happening, happening, happening. The thing about Adventure Time is that there are either ten or eleven seasons, depending on who’s counting — and Amazon counts eleven seasons at $19.99 a pop, which comes to $219.89. That’s… a lot of fancy sandwiches. Almost a month’s worth of groceries. 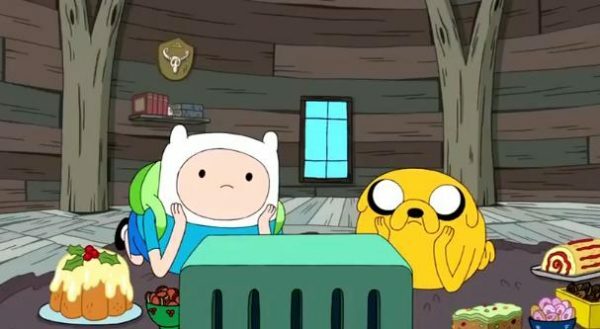 I might rather watch all of Adventure Time than retire a day earlier, but that’s still more money than I really want to spend. The library has most of the DVDs, and will probably eventually get all of them, but I don’t have a DVD player. Then I asked myself how much DVD players cost, these days. Technically, portable CD/DVD drives, since I’d be plugging this device into my MacBook. Turns out you can get one of those for… about $30. So I’m thinking I’m going to spend, like, two fancy sandwich monies on a MacBook-compatible CD/DVD player. Maybe as a present for my just-around-the-corner birthday, since I don’t really want to get in the habit of dropping sammie cash on impulse. And then I’m going to watch all of Adventure Time. UPDATE: After reading y’all’s comments and A LOT of $30 DVD player reviews, I ended up downgrading my Netflix subscription from $10.99 to $7.99 (going from HD to SD) and picking up a Hulu subscription with ads at $5.99/month (plus the first month is free). I am already delighted that I’ll also be able to watch stuff like Brooklyn Nine-Nine, which I STILL HAVEN’T SEEN. Plus I’ll be able to stream from my phone while walking the YMCA treadmill, which you can’t do with a laptop and DVD player.